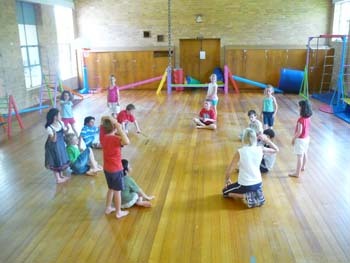 AIM: To provide a physical education program that will benefit each child’s individual needs. The school age program has four major components- aerobic fitness, motor development, skill acquisition and self esteem. The first component of the program is aimed at improving aerobic fitness. 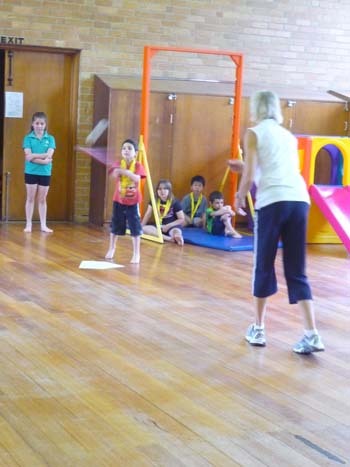 This is achieved using running games, skipping, gross motor activities and minor team games. The second component is aimed at promoting motor planning, muscle tone, spatial and body awareness, balance and fine motor activities. Children may not have acquired these skills when they start school but will continue to develop them during their early school years. The child who falls into the “clumsy” or “poorly co- ordinated” category will be helped to achieve the above through use of the climbing equipment, the trampoline, the trapeze and fun, small activities specially chosen to promote these. If your child has good co-ordination these activities can continue to improve their skill level and consolidate the skills already achieved. The third component is aimed at developing the individual skills required to play a range of games. This involves the acquisition of eye-hand and eye-foot co-ordination. Skill training begins at the most basic stage and increases in difficulty throughout the term. This again enables children of all abilities to participate in the program. 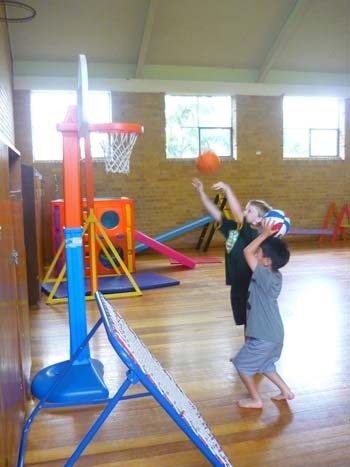 Aside from improving each child’s skill level, the aim is to teach the children to accept and work with every child’s ability or lack of, and to be able to include everyone in the game. The program stresses that winning is not the most important goal at this level, emphasizing the importance of having fun and including everyone. This is particularly relevant in the playground, with friends and with siblings. The final aim of the program is to promote the development of self-esteem in all the children and to enable them to experience success in the activities. Importantly, the program offers all children the opportunity to participate in a range of activities in a controlled competitive environment.